George Rawlyk maintained that Canadian evangelicalism has always been more accommodating than its American counterpart. In Is Jesus Your Personal Saviour? he set out to determine the quintessential nature of evangelicalism in Canada in the 1990s and to distinguish it from the more extreme evangelicalism in the southern United States. Much of Rawlyk's data is taken from an Angus Reid poll in religious beliefs, attitudes, and practices in Canada - the largest public opinion survey of its kind ever conducted - and from scores of interviews with randomly selected evangelicals. The empirical data reveal some surprising findings, among them that sixteen per cent of all adult Canadians are evangelicals. Rawlyk also drew on his earlier historical work to establish a real connection between early Canadian evangelicalism and evangelicalism today. What emerges in this groundbreaking and often controversial book is a complex, richly textured picture of a vibrant form of populist Christianity as experienced and practised by rank-and-file evangelicals. Is Jesus Your Personal Saviour? will inspire serious debate about the complex nature of Canadian evangelicalism in the 1990s. - Publisher To George Rawlyk Canadian evangelicalism has always been, and still is, more accommodating that its American counterpart. In Is Jesus Your Personal Saviour? he sets out to define the quintessential nature of evangelicalism in Canada in the 1990s and to distinguish it from the more extreme evangelicalism in the southern United States. 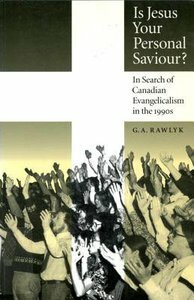 About "Is Jesus Your Personal Saviour: In Search of Canadian Evangelicalism in the 1990'S"